I was introduced to Carte Fini: Fine Italian Papers, by a rep (and my friend) Christine. 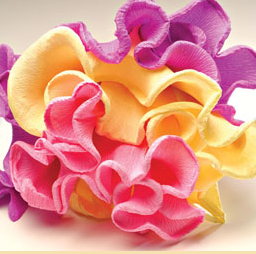 This company offers beautiful Italian made paper in many colors and sizes to be used for the floral and craft industry. Used for everyday flower sales throughout Italy, Carte Fini's wrappings are a wonderful enhancement to an existing line of retail floral arrangements, bridal bouquets, table arrangements, special occasion and traditional designs. I am looking for some feedback and potential ideas from my lovely readers on ways to use this product.